As you might guess Mbwa Fahali Junior is a Mbwa Fahali son. 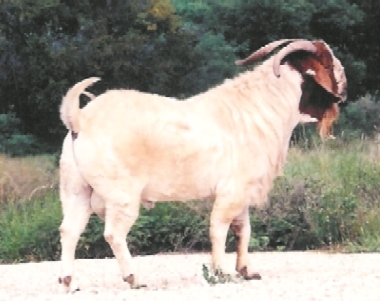 Like his sire, Junior was a high testing goat at the Angelo State University Meat Goat Performance Test. 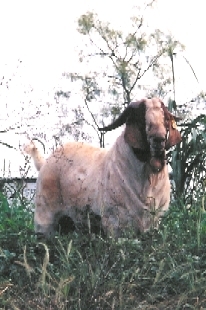 He was tested in 2002 and was our top testing buck ranking 7th out of 108 bucks tested that year. His average daily gain was 0.679 lbs/day. We had originally planned on selling Junior, but when his sire died in November 2002 we decided to retain him. All the does had already been bred that year, so our first kid crop from him arrived in Spring 2004. His twin kids weaned weighing an impressive 65 lbs each on average at 100 days of age. We then tested them at ASU, and they averaged 0.623 lbs/day of gain there, well above the average of 0.56 lbs/day. 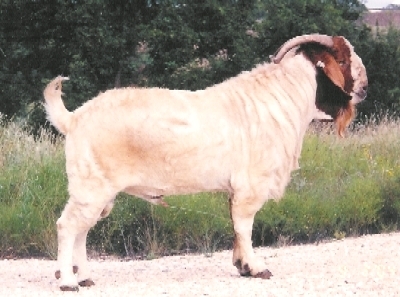 Junior has an impressive pedigree that includes Natural Bridge Boer Goats' Tsjaka and J20, as well as, Downen Livestock's Ubora. He was born on February 11, 2002 at our ranch. We sold him on May 7, 2005 to a ranch in Oklahoma after getting several nice kid crops of high testing kids from him.